Our Interesting February Facts for this week cover a variety of fields, from medicine, to genetics and music. There is always something of historical importance happening somewhere in the world. In the Irish Newspaper Archives you can find out what the Irish reactions or opinions on these events were, and how they were presented at the time. It has been over 61 years since the new polio vaccine was administered for the first time, in Pittsburgh, Pennsylvania. 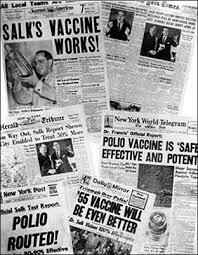 The vaccine developed by Dr Salk, sparked the hope that this will be the end of polio. Posted in this week in history	and tagged with This week through the years, february facts, february history, february events, This week in history, interesting facts	by Phillip. Posted in Fact of the week, Uncategorized	and tagged with Irish History, Law on Contraceptives, Irish Law, Ireland Legislation, Contraceptive Bill	by Phillip. On this day in 1901 London was the capital of all royalty, as Queen Victoria’s funeral took place. Read our earlier blog post and find out more about the event from the Irish Newspapers of the time.